Less than a year ago Carolina Panthers were taken over by David Tepper, the transaction broke record at the time with its value of $2.3 billion. So he's got the money. Now we're getting more insight into the ideas he also holds for the team. “Some of these things take a little bit of time... Listen, I would love to have the (Rolling) Stones here,” Tepper added, laughing. “I would love to have the Stones here. But we couldn’t do it at this point. We’ll look to have some concerts in here. Some of these things are planned out in advance – we are looking now into how to (have more events). One thing Tepper would wish to change structurally is the roof. “What I would love, if we could ever do it and get people to support it, is to put some sort of roof on here and have a Final Four in North Carolina... I love that idea. It drives me nuts.” he said. While clearly in gest, Tepper's remark caused quite some buzz among the Panthers' fanbase. While in engineering terms adding a self-sustainable dome over the stadium would be possible, viability of such idea is questionable. 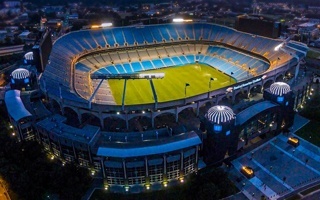 Even the most recent addition to Bank of America Stadium, giant screens of 2014, make it more difficult by increasing heigh of the stadium substantially. It's almost certain that any dome would cost more than the entire stadium had consumed back in 1996 ($248 million). As things stand, Bank of America Stadium is nearing the end of its lifespan in current form. While structurally the building has decades left, it would require major overhaul to keep up with how the NFL experience is changing. A feasibility study is thus required in order to present the best way forward.